While this might be premature (don't worry, Christmas is still a few days away), the President (likely) signed into law the Mortgage Relief Assistance Act as part of the $600B spending bill that passed in the House of Representatives and the Senate and reported was to be signed by the President last Friday. This year, it was not only retroactively extended as was the case in the past two years, this year's extension date actually moves forward through 2016. 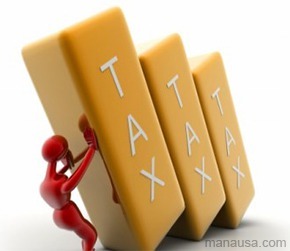 For the first time since 2012, people can make the decision to do a short sale with the knowledge that they will not be taxed for the amount of mortgage debt that is forgiven by their lender(s). First of all, if you are happy in your home and do not need to move, this really isn't for you. Home values are on the mend for most areas and most price ranges, so enjoy your home and you will likely be growing positive equity in your home over the next few years. But if you are trapped in your home and do not know what to do, a short sale is definitely something you should investigate. First and foremost, you can move on with your life without picking up a hefty tax bill from Uncle Sam. But there is also the benefit of the reduced impact on your credit score and your ability to borrow money in the future. 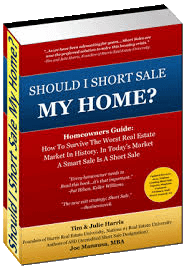 We offer this free e-book to explain the short sale process to everybody who owns a home and wants to know more about all of their options. With over 86 pages of information on nearly every short sale question that we have ever received, it is a valuable resource for homeowners. The book includes information about the Home Affordable Foreclosure Alternatives (HAFA) as well as the loss mitigation phone numbers for most lenders in the United States. Finally, we offer complete State-by-State guidance for our readers who are not necessarily located in the state of Florida. Get your free copy now. All you have to do is tell us where to send it! While credit rules continue to change and evolve, it is evident that the reporting agencies and lenders consider a foreclosure far worse than they do a short sale. The impact of the former versus that of the latter is a difference in your scores as well as a difference in the amount of time they will continue to impact your credit. Short sales are by-far the better solution for people who plan on borrowing money (for anything) in the future. If you would like to know more about your options for selling your home, download the free resource "Should I Short Sale My Home" by following the link. Can you short sell a rental property? Absolutely Richard, we have helped many investors liquidate properties that no longer make sense to own. This is good news. However, I wish something could be done to lessen the credit score impact of a doing short sale. The threat of credit damage alone will stop a great many trapped homeowners from escaping. Still nothing on the IRS site for those of you asking about "was it really signed." I believe it was, but the extension date on the IRS site remains through 2014 (as of 12/30/2015). M.S. Wood - Actually, if somebody does a short sale while remaining current on their loan payment, the short sale only costs them about 50 points. I've seen people with mid 700 scores immediately after a short sale. And there are loan programs that will get them back into ownership after two years. Good information, but, I am still wondering if the "Mortgage Forgiveness Debt Relief Extended Through 2016" has been signed.